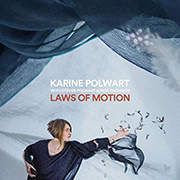 Multi award-winning songwriter and musician, theatre maker and published writer Karine Polwart – six-time winner at the BBC Radio 2 Folk Awards, including 2018 Folk Singer of The Year – released new studio album Laws of Motion to critical acclaim in 2018. It is the latest in an evolving series of collaborative projects across which Polwart has combined music & storytelling with politics & environmental-societal issues and is the follow-up to 2017’s much-praised A Pocket of Wind Resistance, which earned Karine & co-writer Pippa Murphy a New Music Scotland Award for its innovative blend of folk music, spoken word & sound design. Karine recently launched her Scottish Songbook album, recorded alongside long-term collaborators Inge Thomson (accordion) and brother Steven Polwart (guitars), at a sell-out Celtic Connections show and is releasing the album in August 2019. On it she reimagines a clutch of beloved songs that cut across fifty years of Scottish pop. Eighties classics from Deacon Blue, The Waterboys and Big Country sit alongside the stadium balladry of Biffy Clyro. The Scottish Songbook reveals yet another dimension to the singer-songwriter’s multi-award-winning artistry.